What Are the Best Cigars for Beginners? A “first cigar” is like a “first beer”, or “first coffee” or any other “first”; your first experience with something will invariably color your lasting impressions. For those wanting to try cigars for the first time, the question of where and how to start is particularly daunting. Even among seasoned aficionados, there is no clear consensus on what are the best cigars for beginners. How Do You Decide What are the Best Cigars For Beginners? That’s a difficult question to answer, and there are a few different schools of thought. The most common piece of advice is to simply start out with a mild, mellow cigar. This is a pretty common sense maxim. New and casual smokers will often be turned off by the intensity of a full-bodied cigar. Whenever you hear horror stories about someone getting sick from trying a cigar, they very likely tried a more full-bodied cigar than they were prepared for. Another common approach is to analyze one’s culinary preferences and inform your decision on that basis. Someone who prefers crisp light fare can be expected to prefer a more mellow smoke. Conversely, someone who prefers rich, hearty cuisine will likely appreciate similarly bold cigars. When in doubt, it never hurts to defer to an expert. A professional tobacconist will know the questions to ask to help narrow down what would make for a good starter cigar for you, specifically. As there’s no accounting for taste, we’ve compiled a reasonably varied list of suggestions for good starter cigars. Many are popular favorites, and they constitute a fair range of bodies and flavors. With a legacy of over one hundred years, Arturo Fuente is one of the most recognized and respected brands in the industry. They are renowned all over the world for their quality and consistency. They are widely considered one of the best cigars for beginners looking to ensure that their first experience is a positive one. The classic Arturo 858 has a mellow-to-medium body and flavor. It’s made from pure Dominican tobacco and is available with both a dark Cameroon leaf wrapper or a light Connecticut wrapper. At just over $5 a stick, they’re an excellent value. The Ashton brand is known for producing cigars with a more subtle, subdued flavor. This makes the Ashton Classic an ideal cigar for the novice smoker. They’re made of a blend of Dominican tobaccos and bound in a golden-blonde Connecticut Shade wrapper. Though they make for a mild smoke, they nevertheless boast a full, creamy flavor profile. They can be had for a little under $10 a stick. Though a relative newcomer, Rocky Patel has established itself as a premier boutique brand since its inception in 1996. The 1999 Vintage is another mellow-to-medium bodied cigar, making it palatable to most tastes and a strong choice for newcomers. It is packed with Rocky Patel’s signature blend of aged Dominican and Nicaraguan tobacco and bound in a 7-year-old Connecticut leaf wrapper. Its flavor is rich and earthy, with a little bit of spice thanks to the Dominican filler. As a boutique cigar, they run about $10 per stick. Another household brand, Romeo y Julieta was originally founded in Havana in the Golden Age of Cuban cigar making. Luckily for those of us stateside, they have since relocated to The Dominican Republic, making their products freely available. The Reserva Real contains a mix of Dominican and Nicaraguan long filler tobacco and boasts a richer flavor than the classic 1875 line. It has a mellow-to-medium body, however, preventing it from being overwhelming. This combination makes it an excellent choice for a beginner who has already whet their appetite with more subdued ci rs, and is ready to experiment with something a touch bolder. They cost around $6 a piece. Flavored cigars don’t typically command much respect in the cigar world. The stereotypical flavored cigar is machine rolled instead of handmade, stuffed with the scrap tobacco that other cigar makers throw away, and coated in a sickly sweet flavoring to mask its shortcomings. Drew Estate decided to do something about that with their ACID brand. Handmade with high-quality long filler leaves, ACID shows what flavored cigars can be when approached with the commitment to excellence befitting a deluxe cigar. Of their offerings, the Kuba Kuba is the popular favorite. It’s a medium bodied cigar, making it a little heavy relative to many of the other selections on this list. But the body is complimented by a sweet, creamy flavor. It makes for an excellent starter cigar if your tastes skew toward the richer end of the spectrum. They run around $10 a stick. Macanudo is the top-selling cigar brand in the world, and for good reason. They’re about a perfect marriage of quality and value. Their flagship Cafe cigar is an easy candidate for one of the best cigars for beginners. mellow body makes for an easy, pleasurable smoke that novices will appreciate. Their flavor lives up to the name “Cafe”. Their mix of Dominican and Mexican filler and blonde Connecticut wrapper impart a mellow flavor that tastes of coffee and spices like cinnamon and nutmeg. They generally cost about $6 a piece. Only recently established in 2003, the My Father line of cigars has quickly made a name for itself. Their Flor de las Antillas is a medium-bodied cigar packed with 100% Nicaraguan tobacco in a dark Nicaraguan Sun Grown wrapper. The flavor is sweet and earthy, with overtones of cocoa and cedar, with a little bit of spice. Routinely receiving high ratings from critics and receiving several Cigar of the Year honors, the Flor de las Antillas is a bargain at about $7 a stick. Padron is reputed to make some of the best cigars in the world. They’re the recommended cigar for the new smoker who has to have the best of everything. Their flagship cigar has a medium-to-full body, so novices will likely want to start with one of the more conservative corona or robusto sizes to avoid being overwhelmed by their sheer strength. The filler is a mixture of hearty Nicaraguan tobaccos which produce a complex flavor with a pleasant, sweet finish. Despite their sterling reputation, they are rather moderately priced at around $6 a piece. Selecting a cigar is only the first step. Certainly, you could always just bite the tip off of a cigar and light up with a butane torch. But a cigar is meant to be enjoyed. To get the most out of the experience, a novice would do well to brush up on some basic smoking technique. With time, most cigar smokers can expect to build up a reasonable collection of cigars. 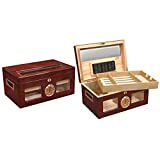 Properly storing your cigars requires a humidor. 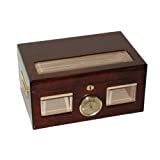 Which humidor is right for you depends on your needs and requires several factors be considered. As the art of cigar making has progressed, properly storing them has become its own science. Proper preparation and care is essential. But don’t let that dissuade you. The skills are easily learned, and the knowledge readily available. Once mastered, you’ll reap the rewards that come with having a smooth, relaxing smoke ready whenever you need one.